Netgear have released the nattily-titled Netgear Digital Entertainer HD EVA8000. First unveiled at CES2007 a month or so ago, the Netgear Digital Entertainer is a media receiver that could be the holy grail for all streaming media fanatics. Not only can the Digital Entertainer stream digital content form PCs and Macs, it’ll also stream YouTube videos, Flickr pictures and torrents direct from your computer to your TV, and all in glorious HD via a HDMI port. More details of the Netgear Digital Entertainer HD after the jump. The Digital Entertainer is smart – really smart. First up, it’ll search your PC (or several PCs if you have a home network) looking for media such as HD movies, TV shows, music files and pics, and collate them all together into a single media library. It’ll then make this library available to you through your TV without requiring any software installed on your PC. Yes, this box of tricks contains all the software you need, effectively delegating content aggregating and sharing to the media receiver itself, and relieving your tired old PC of this duty. The PC therefore effectively acts as a simple file server, leaving it free to perform other duties should you wish. Once the Digital Entertainer has indexed all your media, you can stream it directly it to your HDTV or home theater. 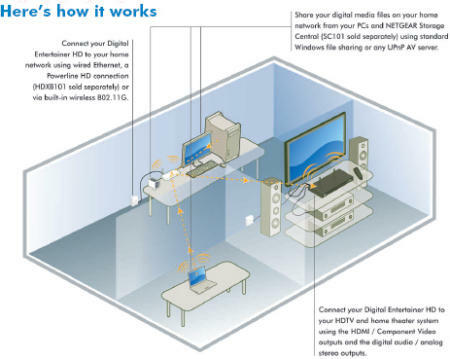 The Digital Entertainer connects to your PC either wirelessly (802.11G) or via Ethernet, to your HDTV via HDMI or component video connectors, and to your home theatre/hi-fi via either digital or analogue stereo outputs. Better still, not only can you stream your content directly to your TV, you can also stream it to a laptop or other PC in the house over via Wi-Fi. Although impressive, it’s not just the connectivity on offer tha tmakes the Digital Entertainer HD so good. the way it handles the content itself, streaming it to your TV without any software required genius. You can stream movie files downloaded from BitTorrent, stream YouTube video clips or Flickr images directly to your TV, Internet Radio to your HiFi, or even RSS feeds direct to your TV, making for perfect integration between the Internet, your PC and your TV and audio systems. And if all that isn’t enough to have you drooling, the Digital Entertainer also offers full 1080p HDTV support, two USB 2.0 ports, enabling you to plug in either a media file-laden USB stick or MP3 player from which to stream content, a huge array of supported media formats, and full compatibility from interconnectivity standards such as UPnP and DLNA, which will let you stream media from suitably-equipped mobile phones such as the Nokia N80. Did I forget to mention it’ll also control your PC’s PVR recordings if you have a TV tuner in yor PC? Yup, it’ll do that as well! And the price of this digital media receiver hold grail? Just $399. This really is a high-point in the burgeoning media receiver market, and with a box this good, it’s giong to be a great year for media streaming fans as other manufacturers race to catch up. More details of this and other media receiver annoucements should be on their way tomorrow, direct from the opening of CeBIT 2007. Watch this space!